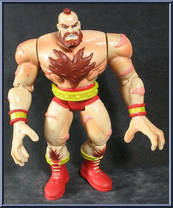 Zangief is a tough former Russian wrestler who trained for the Street Fighter competition by grappling with grizzly bears in the snow covered Siberian mountains. 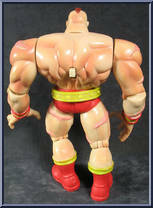 Zangief constantly seeks new opponents and greater challenges as he strives to prove the superiority of his massive Russian physique. 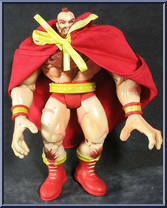 Although he claims to fight for the honor and glory of mother Russia, Zangief has been at times the pawn of Bison. When Bison encourages Zangief to align with Apocalypse to destroy the X-Men, Zangief welcomes the opportunity to encounter new opponents. 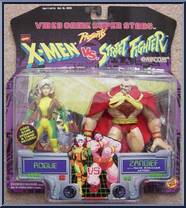 Zangief challenges Rogue, one of the X-Men's strongest members. This southern Belle's beauty is matched only by her might. Super strong, near invulnerable, gifted with flight and with a touch, Rogue's "Power Drain" allows her to steal other fighters' abilities. 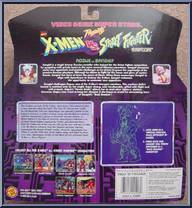 However, Rogue may want to keep her distance if she hopes to avoid the devastating force of Zangief's "Back Breaker". Contribute pictures, update details or suggest corrections for Rogue vs. Zangief. Write a review about Rogue vs. Zangief.